POLICE officers and search and rescue teams have carried out a joint operation in Petersfield as concerns about a missing man grow. Also involved in the search, which took in the town centre, the Heath, land beside Petersfield Hospital, and the water meadows near Tesco, were volunteers from the Hampshire Search and Rescue charity (Hantsar). Hantsar spokesman Trevor Vidler said: “We were called out to support the police in the search, and had about 28 volunteers there in teams of three and four. “We searched areas across the town, including all the culverts in the stream that runs from Winchester Road through the town past Waitrose and on to Penns Place. The Hantsar teams used the car park of the BT building in Charles Street as the operations base for their control vehicles. 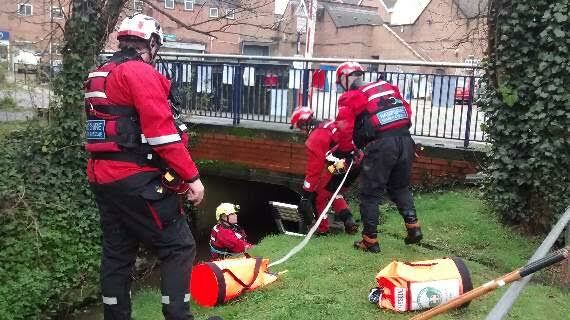 As well searching the Heath, a team also searched land behind Petersfield Post Office, and other areas of the town. Other Petersfield residents saw the Hantsar teams on the Heath, and searching the water meadows. Scot MacKenzie (58), who is described as vulnerable, was last seen in the Tipner area of Portsmouth early on Monday, January 15. He is described as white, approximately 5ft 10ins tall, medium build, with grey receding hair, and was last seen wearing an olive green anorak. Soon after he disappeared police said the keen Pompey fan had kept in touch with former BT colleagues he worked with in Petersfield, and that he was fond of the Heath. On the day he disappeared CCTV footage shows Scot at Portsmouth and Southsea train station at 2.52pm, but it is unclear whether he then boarded a train. There was also an unconfirmed sighting of him at Queen Elizabeth Country Park visitors’ centre on at 1.40pm on January 29. A spokesman said police were still very concerned for his safety, and that the searches weren’t based on specific information, but were part of the ongoing investigation into his disappearance. The spokesman added: “If you see Scot, or know where he is, then please call us immediately on 101 quoting 44180023652.